Raising Meat Rabbits. View animal photos of rabbit carcasses to see the importance of meat rabbit breeds, hybrid vigor, and growth ratios on rabbit meat quality. The breed or breeds you choose may determine the success of your enterprise. FYI: What follows is a graphic meat rabbit discussion, which might be uncomfortable for any who prefer to view rabbits as pets only, to the exclusion of biologic evidence of mankind's omnivore need to eat animal-based nutrition for long-term wellness. Humans have a long history of eating meat, including rabbits. Humans invariably develop a Vitamin B12 deficiency if they eat a solely plant-based diet without supplementation. Our understanding of the science is linked here, in case you're interested. How important is your choice of meat rabbit breed? 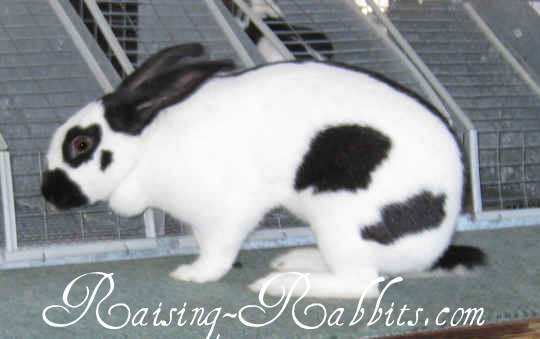 Our Meat Rabbits page offers an in-depth discussion of meat rabbit breed choices. It also lists a few breeds that might not be ideal. One of these less-than-ideal breeds, if you're raising meat rabbits, is the Checkered Giant, for example. 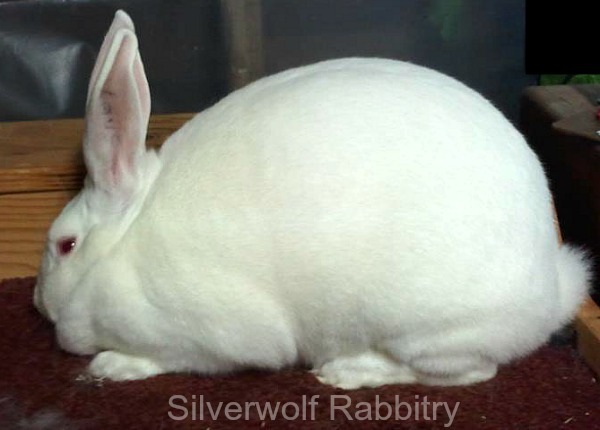 The New Zealand White rabbit had experienced early rapid weight gain at least 8 weeks ahead of the Checkered Giant, and then gained slowly and steadily; the Checkered Giant was still immature at 6 months. In comparison, Ms. Ford’s New Zealand White rabbits typically reach market weight of 5-6 pounds within 9-10 weeks. The dress-out percentage is near 50%, meaning that a 5-pound rabbit yields a 2.5 pound carcass. Commercial enterprises frequently achieve a 4.75 – 5 pound rabbit by age 8 weeks. Over many decades, certain breeds of rabbits have been selectively bred to serve a particular purpose, for example, meat production. 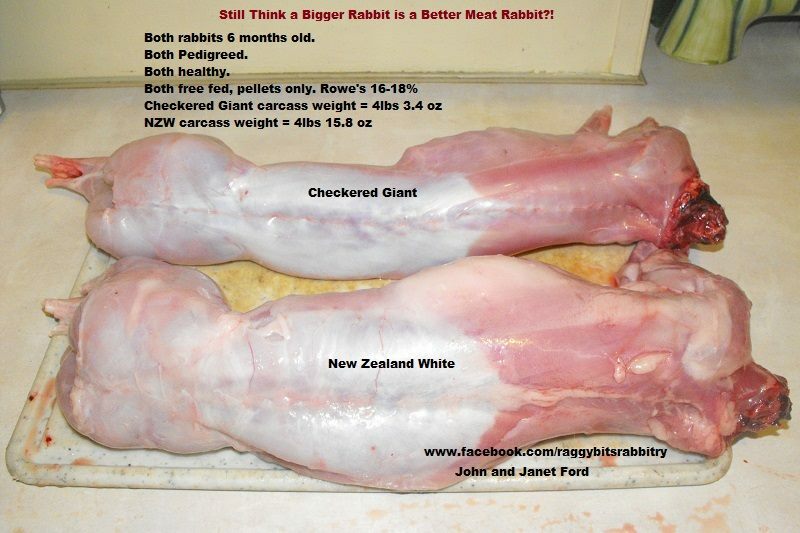 The New Zealand White Rabbit has served as the meat rabbit breed of choice since the 1920's. As farmers consistently kept and bred the meatiest rabbits with not-too-heavy bones, their selective breeding served to enhance the ability of the New Zealand rabbit to grow rapidly when young on moderate amounts of feed. Their body type shifted from racy to meaty, and the meat-to-bone ratio improved dramatically. Rabbit farmers want their New Zealands to have heavily muscled bodies because the purpose of the breed is to feed pets and people. The Checkered Giant has also been around since the early 1920's in the USA. Its body was also a product of its genetic background, a fancy running breed desired for its size and distinctive spotted coat. Checkered Giant breeders didn't want a round meaty rabbit, they wanted their sleek, energetic giant, and worked hard to create just the right rabbit for their purposes. There was nothing wrong with the Raggy Bits Checkered Giant rabbit. The breed is just not a good fit for the purpose of raising meat rabbits. If you're raising meat rabbits, you'll want to take advantage of the principle of hybrid vigor, also known as heterosis. One achieves hybrid vigor by cross-breeding two unrelated breeds or bloodlines within the same breed. This results in heterosis, meaning the state of carrying two different genes for each trait. The different genes can each cover for any weakness in the other half of its pair. The result of heterosis, or hybrid vigor, is increased vigor, health, growth rate, disease resistance, and fertility. It is a temptation to breed together your fabulous hybrids. You can do it, of course, but within a few generations you will lose the hybrid vigor advantage--your rabbits will no longer be hybrids. This is why Californians are often kept and crossed with New Zealands. The vigor factor will be strongest if both sire and dam are purebreds of their individual breeds. This is also why Altex sires are used to create terminal cross offspring. The Altex represents a third breed, further enhancing hybrid vigor and growth rates. Terminal crosses can reach market weight as early as 7 – 7.5 weeks of age. Again, if you then save a terminal cross to use in your breeding herd, you will eventually lose the hybrid advantage.